Gov. Chris Christie arrived at a ballroom in Midtown Manhattan on Jan. 31, 2014, to celebrate Howard Stern’s birthday. It did not, for the moment. But it would not have been the first or last time that Mr. Christie’s desire for celebrity access and expensive trips has raised eyebrows. That tendency — the governor himself says he wants to “squeeze all the juice out of the orange” — has put him in ethically questionable situations, taking benefits from those who stand to benefit from him. Last month, Mr. Christie prompted a state ethics inquiry after he flew to at least three games of the Dallas Cowboys, his team since boyhood, on the plane of the owner, Jerry Jones, whose company had received a contract with the Port Authority of New York and New Jersey after the governor recommended it. A spokeswoman for Mr. Christie, who is currently on a three-day trip to London, did not dispute the details of the trip to Israel and Jordan, which were described in interviews with several people close to the administration or involved in the trip, and in documents seen by The New York Times. But the spokeswoman, Maria Comella, described King Abdullah as “a friend” the governor met at a salon-style dinner in New York hosted by Michael R. Bloomberg, who was the mayor at the time. “King Abdullah invited the governor and his family to Jordan as his personal guest so the two families could spend time together,” she said on Sunday. Ms. Comella also said Mr. Adelson had not been personally lobbying the governor against the online gambling bill. In the end, Mr. Christie signed the bill. He cited pressure from unions that argued it was needed to keep casinos open, and the need for revenue to balance the budget. Mr. Adelson later told a somewhat different story: He said Mr. Christie told him that had he vetoed the bill, as Mr. Adelson would have wanted, it would have been overridden. That, in retrospect, seems unlikely. Republicans in the Legislature have previously changed their positions rather than override a veto by Mr. Christie. The governor has also been a guest on the private plane and in the stadium box of Woody Johnson, the owner of the New York Jets and another opponent of the gambling bill. Early in his tenure, Mr. Christie set up a group to entice foreign businesses to New Jersey. That group, Choose N.J., is financed by companies that are forbidden by pay-to-play laws to donate to the governor, because they have business before the state, including legal work, and contracts for roads and infrastructure. The group partly financed the 2012 trip to Israel, as well as three trips the governor has taken over the last year, to Mexico, Canada and his current destination, London. Mr. Christie’s foreign travel has helped him build his credentials and his contacts as he prepares to run for president. Choose N.J. sounded dubious in a report last year about enticing business from Britain. Interest was strongest, it found, from Belgium, France, Germany, Israel, Sweden and Switzerland. But London is a prime market for fund-raising among American expatriates: In 2012, President Obama and Mitt Romney raised more money in Britain than in any other foreign country. While previous New Jersey governors have flown commercial for trade missions, Mr. Christie flew privately for three. (His spokeswoman said he flew commercial to London.) He has taken family on all. He stays in five-star properties: the King David in Jerusalem, the Intercontinental in Mexico City. The hotel in London, the Corinthia, has a Baccarat chandelier and masses of flowers refreshed every morning. Mr. Christie’s entourage takes over conference rooms laid out with elaborate spreads of food at all hours. Ms. Comella said Mr. Christie’s office sought a lower rate for government officials whenever possible. Letting the king pay for his three-day weekend in Jordan back in 2012 would not have been allowed if Mr. Christie were, say, president or a United States senator; it is illegal for federal employees to accept gifts of more than nominal value from agents of foreign governments. An executive order Mr. Christie signed in 2010 allows New Jersey governors to have travel and related expenses paid by foreign governments; it does not specifically address gifts such as the parties the king held for him, but the governor’s staff said it was covered under a provision that allowed gifts from personal friends. As he has traveled more widely, particularly during the last year, when he led the Republican Governors Association, Mr. Christie’s first-class tastes have become well known. He made it clear when he campaigned for Mr. Romney in 2012 that he would do out-of-state events only if he was given a private plane, even during the primary, when the candidate’s wife was still flying commercial to save money. The Romney campaign came to understand that he preferred a Cessna Citation X, which, its manufacturer boasts, has exotic wood interiors and a Rolls-Royce engine. State taxpayers paid for Mr. Christie, his wife and two aides to travel to the 2013 Super Bowl in New Orleans, as New Jersey prepared to host the 2014 game. 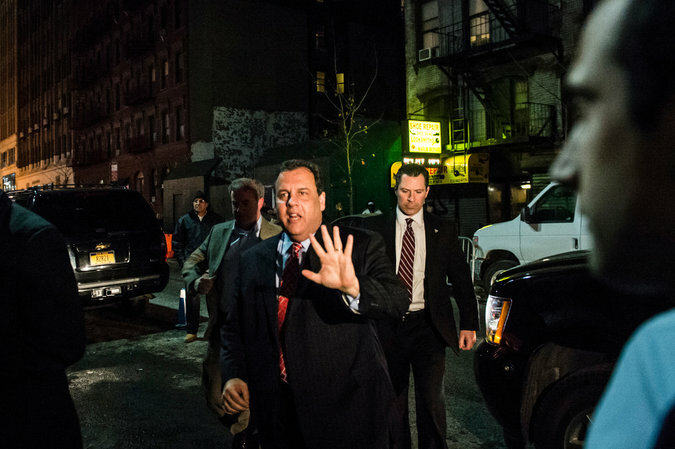 Airfare for four passengers came to $8,146; Mr. Christie’s hotel for three nights cost $3,371. He has fought to shield the cost of his travel. The Super Bowl expenses were revealed only after a judge’s order in a lawsuit brought by The Record, a newspaper in northern New Jersey. In response to other lawsuits and public records requests, the governor’s office has argued that he is not subject to disclosure laws regarding travel, or that it does not have the records. Groups like Choose N.J. and the Republican Jewish Coalition, which also contributed to the Israel trip, do not have to disclose their expenses. As United States attorney for New Jersey, Mr. Christie developed a reputation for flouting the rules on travel. A Justice Department report after he left office found that he was the prosecutor who most often exceeded the charges allowed for hotel stays in different cities, without properly searching for a cheaper alternative, or justifying any exemption from the rules. He stayed at a Four Seasons in Washington and a new boutique hotel in Boston, for example, at more than double the cost allowed for those cities. The report concerned hotel stays, but Mr. Christie’s preference for car services over taxis earned a footnote: He paid $236 to travel four miles from the airport in Boston, and $562 for a round-trip between Central London and Heathrow. Mr. Christie, who by then was governor, declined to be interviewed by investigators preparing the Justice Department report. The revelations in the report prompted the Justice Department to tighten rules about exemptions to stay in costly hotels.